TUESDAY 1 November is the solemnity of All Saints and is a Holiday of Obligation. 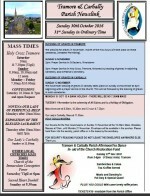 Our Lady’s Carbally, Mass at 11.30am. The blessing for graves in November, month of the Holy Souls will take place on these weekends, (Weather Permitting). 3pm: Prayer Service in Holy Cross, Tramore, followed by blessing of graves in adjoining Cemetery, and St Patrick’s Cemetery. The November blessing of graves in Carbally takes place on Sunday 13 November at 3pm beginning with a prayer service in the church. This will be followed by the blessing of graves in both cemeteries. Our Novena for the Holy Souls begins on Sunday 13 November at the 10.30am Mass. Weekday Masses at 10am, until Monday 21 November. Envelopes will be available in the porches. Please hand them into the sacristy, parish office or in the boxes by the sanctuary. FOR SECURITY REASONS PLEASE DO NOT LEAVE THE ENVELOPES ANYWHERE ELSE.